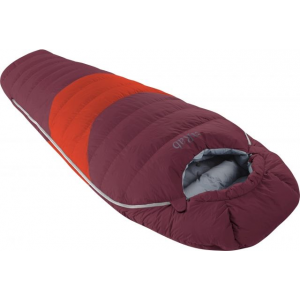 Rab Backpacking Sleeping Bags Morpheus 4 Men's Sleeping Bag (650 Duck Down)-Regular-Left QSG60LZ. Most alpinists opt for full down bags because they provide light, lofty, and compact performance for easier approaches, but there's always the lingering fear that a little water will make down bags pretty useless during chilly nights (and then you're in real trouble up there). The other option is a full synthetic bag that retains warmth in moisture-riddled environments and are generally more durable than down bags. Rab's designers wanted to give you the best of both worlds with the Morpheus 4 Sleeping Bag, which features a lofty down insulated top and a sturdy synthetic base. That way you get the protection you want where you need it most, and the bag's down top keeps things light and compact for the hike. Rab also treated the down with Nikwax to help the lofty feathers retain warmth when wet. Also unique to the Morpheus is the dual zipper (a 1/4-length zipper on the left and a 3/4-length zipper on the right) to allow extra ventilation in case you get too warm. This bag's 12-degree temperature rating is great for summer backpacking in the alpine, backpacking in lower altitudes during the shoulder seasons, and trekking across the desert in the middle of winter. The Rab Morpheus 4 is not available from the stores we monitor. It was last seen August 9, 2018	at CampSaver.com.